How does the enzyme ATP Synthase use a proton concentration gradient to make ATP? I understand what the enzyme ATP synthase does, but I'm not exactly sure how it does it. I've heard that it uses rotary catalysis, but how exactly does this work? How is the energy from the H+ ion harnessed, turned into mechanical energy, and then finally into the chemical energy stored in ATP? Why does the spinning of parts of the enzyme need to occur for this to happen? In brief, the addition and release of protons to the structure cause a conformational change that leads to another conformational change. This series of conformational changes occurs in such a way that it induces a rotational motion. The rotation of the central axel that extends through both hemispheres of this large complex is driven by the proton gradient. Specific residues in the c12 ring are protonated in order to drive this rotation. A high concentration of protons (in this picture the high concentration is found above the complex) allows each of the subunits in the membrane to be constantly loaded with H+ ammunition, ready to fire when it comes to be their turn. The function of this axel is to slightly but significantly change the shape of one subunit at at a time in the red part. Changing the conformation of subunits in the red part is what allows for the three steps in ATP synthesis to occur: binding of ADP and Pi, catalysis of the formation of ATP, and release of ATP. All of these changes occur at the molecular level. The proton forms a bond with a single amino acid of the entire protein complex, but this is sufficient to cause a difference in the most stable 3-dimensional structure of the whole. This could cause either a cascade of changes that result in a net rotation or it could cause a re-stabilization of the structure due to electrostatic forces. Earlier models proposed simple rotational diffusion of a rigid c12 ring, possibly driven by electrostatic forces. The structural data on protonation-linked conformational changes in subunit c indicate that the process may be more mechanical, with local rotations within subunit c driving larger-scale rotations of the c12 oligomer as a whole, in a `wheels within wheels' type of mechanism. The whole paper's a good read. But this is as current as I am on the topic, and it's likely that a more detailed mechanism has been determined for the action of ATP synthase since 1999. Not the answer you're looking for? Browse other questions tagged proteins enzymes cellular-respiration or ask your own question. 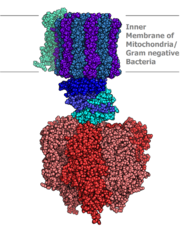 How fast does the rotor in ATP synthase spin? What does “kcal/mol” mean when speaking of enzyme catalysis? How do catalase and other antioxidants neutralize free radicals? What is a detailed chemical explanation for describing how an enzyme may lower the activation energy of a reaction? Does the formation of water inside the mitochondrial matrix help contribute to the proton gradient during the electron transport chain? How does changing the shape of ATP synthase specifically prevent the enzyme from working any longer? Is glycolysis the beginning part of fermentation, or does fermentation follow glycolysis? In which direction does ATP synthase rotate? How does one calculate [Et] (total enzyme concentration) in enzyme kinetics using Vmax?